Violent clashes broke out on Thursday afternoon between Israeli troops and a group of Palestinian young men in occupied Jerusalem. According to a PIC correspondent, Israeli soldiers fired a hail of tear gas grenades on Palestinian civilians and houses in Jabal al-Makbar, southeast of Jerusalem. Earlier on Wednesday, scores of Palestinian citizens were rushed to al-Makased hospital to receive treatment for injuries they had sustained in clashes with the Israeli occupation soldiers. The IOF shot the Palestinian female journalist Marwa Idris with rubber bullet in the back, causing her a rupture in the spleen. Tension has been running high in the city due to Israel's escalation of its violent police raids and settler break-ins at the Aqsa Mosque. In a related development, the Israeli occupation police on Thursday said it would prevent certain Palestinian citizens from entering the Aqsa Mosque for prayers on Friday at the pretext of maintaining security and order. They added that these entry restrictions would only be imposed on all Palestinian men under age 50. Israeli soldiers and police officers kidnapped, on Wednesday evening, at least seventeen Palestinians near the al-Aqsa Mosque, in occupied East Jerusalem, while many residents have been injured, in renewed clashes. Local sources said the army denied the Palestinians access to the al-Aqsa Mosque, for the second time this week, in order to allow dozens of Israeli fanatics to storm the compound. The Maan News agency said that clashes continued late on Wednesday in al-Eesawiyya town, Jabal al-Mokabber, and various alleys and neighborhoods in occupied East Jerusalem, while at least seven Palestinians were injured in al-Eesawiyya, when the soldiers fired rubber-coated metal bullets, gas bombs, and stun grenades. The Police also kidnapped four children in allegedly after they threw stones at Israeli military vehicles. In addition, the soldiers kidnapped a 12-year-old child, identified as Salim ‘Oweisat, in addition to a teenager who remained unidentified. 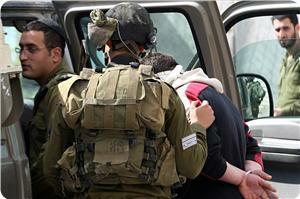 The police and the army in the Old City of occupied Jerusalem also kidnapped at least five Palestinian teenagers. Furthermore, a young Palestinian woman and her brother were injured by army fire in the African neighborhood, next to the Council gate, one of the gates of the al-Aqsa Mosque. Nasser Qous, head of the Jerusalem Office of the Palestinian Prisoners Society (PPS) said the soldiers invaded the African neighborhood area during clashes with local Palestinian youths in the al-Wad Street. Qous said the soldiers fired dozens of rubber-coated metal bullets, gas bombs and concussion grenades, in various streets, largely targeting Palestinian homes, and that a young woman, identified as Marwa Edrees, 22, was shot in her back by a rubber-coated metal bullet while documenting an Israeli invasion into a local institution. The soldiers also attacked her brother, Mahmoud, when he tried to help his wounded sister. Medical sources said Mahmoud suffered fractures in his leg. Mahmoud and his sister were moved to the al-Makassed Islamic Hospital in Jerusalem or treatment. Qous added the soldiers kidnapped another Palestinian, identified as Mohammad Abu Sneina, near the Council Gate (Bab al-Majlis). In addition, dozens of Palestinians suffered the effects of tear gas inhalation, during clashes that took place in the Shu’fat refugee camp after several Israeli military vehicles invaded it, while one Palestinian was shot by a rubber-coated metal bullet in the chest, near the Sports Club in the City. More clashes also took place in at-Tour neighborhood, in the Old City of occupied Jerusalem, after the army invaded it for the second time in less than 24 hours. On Sunday, October 12, Israeli forces stormed Aida refugee camp without any provocation and began shooting tear gas, sound bombs and rubber-coated steel bullets at children in the streets. "Yesterday, they were training soldiers by using families, children and homes as military practice. 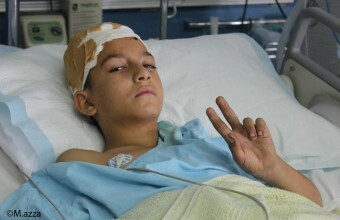 Tamer Abu Salem, 13 years old, was in Lajee Center moments before he was shot in the head with a rubber coated steel bullet. Tamer underwent emergency surgery after arriving at the hospital and he is still in the ICU. 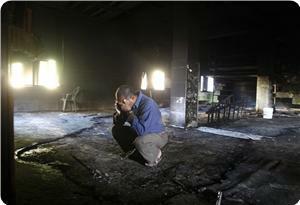 Before the soldiers left the camp, they shot two bullets through Lajee Center's windows as punishment. The occupation is on-going, and our struggle continues." Israeli gunboats have again opened fire on Palestinian fishing boats off Gaza city shores, on Tuesday, at dawn. 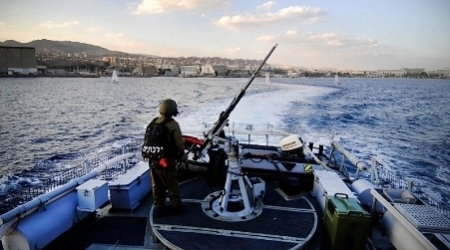 According to Walla Hebrew news site, Israelis opened live fire on the fishermen and their boats, claiming that the men didn’t respond to their calls to move back. The Israeli navy has attacked Gaza fishermen several times since the Gaza ceasefire took effect, Al Ray Palestinian Media Agency reports. The terms of the truce provide that Israel must cease such attacks and further expand the fishing zone, over time. 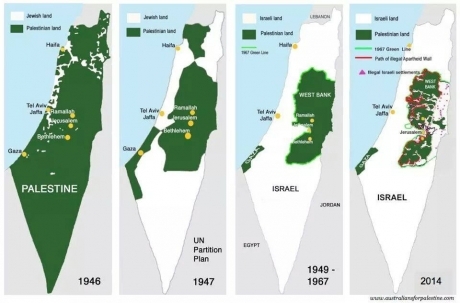 However, Israeli soldiers and civilians alike have not only continued with daily violations against the Palestinian people and their property, but have increased restrictive measures and hostilities across the region, including illegal settlement construction and expansion. No injuries were reported, following Tuesday's coastal attack. As UN Secretary-General Ban Ki-moon toured the Gaza Strip, on Tuesday, urging a revival of peace talks between Israeli and Palestinian political factions, armed Israeli aggression against Palestinians continued in the occupied West Bank, by both soldiers and civilians alike. Palestinian youth Anas Na'ajeh was shot in the face, today, with a rubber-coated steel bullet, while several others suffered tear gas inhalation, during clashes which erupted in al-Fara’a refugee camp, northeast of Nablus. Na’ajeh was transferred to a hospital to receive immediate treatment. Witnesses told WAFA Palestinian News & Info Agency that a large military force raided the camp, opening live fire and discharging both tear gas and sound bombs at a number of unarmed residents. Soldiers raided several homes after blasting the front doors, using some residents as human shields. They also raided and ransacked several other homes in the area, turning one house into an investigation point. Earlier today, Israeli forces turned a Palestinian home into a military barrack, while raiding and searching several Palestinian-owned homes in the town of Yabod, to the west of Jenin. According to security sources, forces raided the home of one Walid Abu Bakir and turned it into a military observation point. Forces further raided several other houses and searched a shop, interrogating local residents. Earlier this week, Israeli forces raided yet another house in Hebron, in systematic continuous Israeli violations of Palestinians privacy and human rights. Forces, on Tuesday, abducted six Palestinians from the occupied West Bank districts of Hebron and Tulkarem, including a university student, while serving a youth from Bethlehem with a notice to appear for interrogation, according to reports by local and security sources. Four Palestinians from the town of Beit Ummar, to the north of Hebron, were also taken following a raid on their homes. The kidnapped were identified as Sami abu Jodeh, age 19, Sofyan and Mohammad Ikhlil, and Mahmoud Abu Ayyash. Forces also took into custody, again, previously released prisoner Ihsan Dababseh, age 30, a woman from the town of Noba, to the west of Hebron. Meanwhile, in Tulkarem, university student Kamal Azim, 29, was kidnapped after forces raided and thoroughly searched his home. 21-year-old Mohamad al-Masri was also served with a notice to appear for interrogation before the Israeli intelligence in 'Gush Etzion', a cluster of illegal Israeli settlements located near Bethlehem. 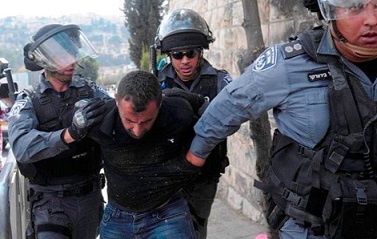 WAFA further reports that Israeli police assaulted, onTuesday, Director of al-Aqsa Mosque, Omar Kiswani, in occupied East Jerusalem, and also arrested an Islamic Waqf (IW) staff member after beating him, according to IW department. According to IW, an Israeli police unit intercepted IW Director, Azzam Tamimi, while touring the mosque along with Kiswani. Police then attacked Kiswani and violently assaulted him. Another police force present at the location assaulted one Mohannad Idris, an IW guard, before abducting him as well. This latest civilian assault by Israeli forces comes after a vigorous Monday marred by violence, which erupted as illegal settlers broke into the Mosque compound to celebrate the Jewish holiday, Sukkot. Angered by the obtrusive invasion, worshipers began chanting religious slogans to fend off the assault. Shortly after this, police chased hundreds of protesting worshipers towards the southern main building of the mosque and attempted to raid it, damaging a number of historical gates and windows in doing so. Dozens of worshipers were reported to have suffocated after Israeli police guards fired tear gas canisters in the building, where they were seeking shelter. Furthermore, in the village of Aqraba, to the south of Nablus, on Tuesday, Israeli settlers sprayed the walls of a local mosque with racist graffiti and intentionally set it on fire, according to local sources. Hamza Dereya, of the Anti-Settlement Committee in the village, stated that several settlers invaded the village before dawn and set fire to the local Abu Bakr Mosque. Settlers then proceeded to spray anti-Arab and miscellaneous hate graffiti on the walls. Additionally, Minister of Religious Affairs Yousef Id’es said that the incident was the result of an ongoing Israeli racial campaign, within a nurtured environment of hatred which allows settlers to insult the Muslim and Christian holy sites in the city of Jerusalem, with the aim of forcing a temporal division of al-Aqsa Mosque. The incident is but one in a series of similar violent episodes carried out by groups of Israeli settlers, during recent months, as Israeli forces continue to back settler aggression and impose increasingly tighter restrictions on worshippers. Meanwhile, the Grand Mufti of Jerusalem and Palestine, Sheikh Mohammad Hussein, said that further assaults on the holy sites, on top of those at al-Aqsa Mosque, could potentially turn the region into a vertiable time bomb, foreshadowing an impending religious war in the region, should such assaults continue. “Divine religions prohibit assaulting worship places and ensure they are away from any rounds of conflict,” Mr. Hussein was quoted to say, as he called for the ‘criminals’ to face justice while praising the local residents of Aqraba for defending their mosque. WAFA reports that incidents of property destruction and arson, attacks on vulnerable communities, and continuing seizure of large areas of land are but a few forms of the daily aggressions against the Palestinian population, and especially in areas adjacent to the illegal settlements in the West Bank. Settlers, on Tuesday, plundered a privately-owned Palestinian harvest of olives near Tulkarem, in the northern West Bank, according to WAFA correspondence. AbdulRahman Rajab, owner of the crop, said that he was surprised to arrive in his land, only to find 10 large sacks that had been stuffed with olives now missing. He said that he had left the crop about two days ago, after being assaulted by illegal Israeli settlers. In addition to Mr. Rajab's stolen crop, his donkey and agricultural tools were looted by the settlers, who apparently came from the nearby illegal settlement of ‘Avnei Hefets’. Rajab additionally stated that he was on his land, along with his three sons and his wife, harvesting olive trees together, when three colonial settlers attacked them with stones, injuring the wife in her shoulder and his 8-year-old son in his legs. The family was then forced to leave, to avoid any further physical injuries. Meanwhile, the Israeli army further assaulted farmers in the village of al-Araqa, to west of Jenin, firing tear gas canisters at them while they were harvesting another crop of olive trees, causing them to suffocate. The Israeli Occupation Forces (IOF) arrested Tuesday evening a Palestinian young man from Yatta town in al-Khalil and closed the entrance to Carmel town to the south of the city. Coordinator of Popular Committee against Settlement and Separation Wall Rateb Jabour confirmed that an 18-year-old young man was arrested in Yatta town. IOF troops stormed Carmel town after closing its entrances and erecting a number of checkpoints throughout its neighborhoods in order to pave the way for settlers’ break-in. Meanwhile, 12 Israeli military vehicles stormed Tuesday evening Yabad town, south of Jenin, and broke into a number of homes. Local sources said that IOF soldiers turned one of the homes into a military checkpoint after detaining all of the family members in one single room. Several civilian homes and shops were also stormed and searched during the raid campaign, while dozens of vehicles were stopped and searched at the entrance to the town. Along the same line, IOF carried out a night raid campaign throughout Jenin and served a summons to a 22-year-old young man after breaking into his parents’ home. More than 15 people were injured after being hit with tear gas bombs and rubber bullets fired by Israeli forces during clashes that erupted overnight in Anza town near the city of Jenin. 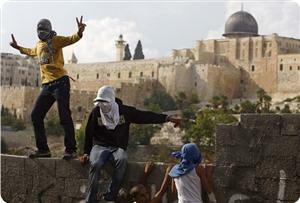 Palestinian youths in their turn threw stones and empty bottles at the invading soldiers. Dozens of injuries were reported Tuesday evening among Palestinian farmers in Arqah village, west of Jenin, after being brutally attacked by Israeli occupation forces (IOF) while picking their olives. Local sources told a PIC reporter that IOF soldiers surrounded the olive groves near the village and started firing tear gas bombs towards the farmers, a lot of whom suffered breathing difficulties. 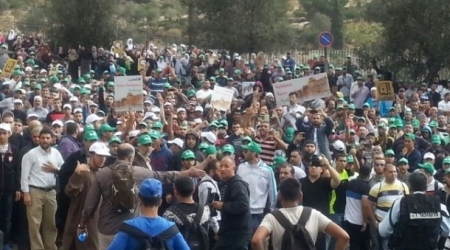 The soldiers brutally attacked the farmers in attempt to force them to leave their lands, however; the farmers refused, which forced the soldiers to retreat to the separation wall and monitor them from afar. For its part, the Israeli human rights organization Yesh Din published updated figures highlighting that 96.6 percent of investigations into settlers' attacks on Palestinian olive trees were closed due to Israeli police failings. Between 2005 and September 2014, Yesh Din documented 246 incidents in which complaints regarding deliberate damage to fruit trees in the West Bank led to the opening of a police investigation. “This does not account for all such incidents, but only those brought to the organization’s attention and processed by it”, according to the organization's report. “Of 246 investigation files opened by the SJ Police District between 2005 and 2014 and monitored by Yesh Din, just four have ended in indictment; 223 files were closed in circumstances pointing to investigative failures. This represents 96.6 percent of the files in which processing has been completed and where the outcome is known to Yesh Din”. 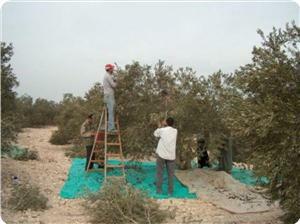 The Palestinian village that has suffered the greatest number of attacks on trees is Burin, Yesh Din pointed out. “In Burin alone, over the years Yesh Din has documented 35 incidents of damage to trees that were reported to police. Only one of these complaints led to an indictment”. Three Palestinian children were injured late Tuesday when an unexploded Israeli ordnance blew up in Beit Ummar in the Hebron district, a local official said. 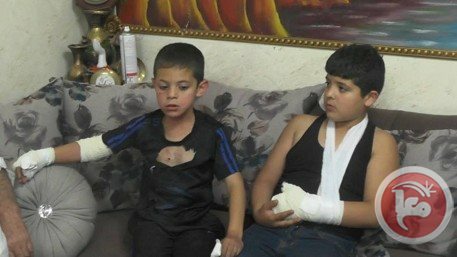 Muhammad Awad, coordinator of the local popular committee, said in a statement that the ordnance exploded near a house on Jerusalem-Hebron road, injuring 9-year-old Hasan Mahmoud Masyif Sabarneh, 10-year-old Yamen Muhammad Nassim Sabarneh, and 6-year-old Muhammad Jamal Mustafa Sabarneh.